During the week I was sent a teaser picture by the guys from Mustang Maniac. What was that picture? It was of my engine. Now there is nothing new about that, as I have posted (quite) a few of them myself, but this was a little different. The engine was sitting at the front of my car. The guys were happy that the engine was ready to go in. It was going to be a weekend for me as it was my first engine refit and I couldn’t wait. On arrival the brake lines were finished and Yogi has excelled himself yet again. Now I love doing the brake lines, but I must admit, Yogi does them better than me. The brake reservoir was in, connected up to the three way splitter box and not the four way original and the pipe work to the disc brakes are now in place. It’s a different car already to look at. I would be happy with the drum brakes and they would work if it was only me on the road. However I am worried about other nutters on the road that do stupid things in front of me. I know I can stop the car where I want to when I want to, but I can’t cater for the excellent braking capability of modern cars, and in comparison my drums were not going to be able to stop me as fast in an emergency. I always drive with plenty of space between me and the car in front, but you just never know. My new disc conversion will give me that extra stopping power should I need it and safety peace of mind. The brake reservoir now has front and rear split for the brake lines. Should the pipes leak or fail on either the front or back, then I have would have the other independent half to stop me, at some point that is. The original brake booster set up was a single reservoir for all four corners of a drum brake distributed by a three way splitter, so if one corner brake cylinder leaks, then the whole lot gets dangerous. With a brute of an engine like the 289ci you need it to stop as well as get of the line. Drums are notorious for fade when they get hot, on England’s roads the inclines can be quite step, so constant braking down a long hill could cause issues. But in the USA everything is pretty much flat, apart from a few places like San Francisco of course, so it wasn’t so much of a problem then. Mustang Maniac had ordered me in a particular disc conversion kit that I was after for my car, and it arrived at the end of last week. Yogi and Adam wasted no time in bolting the parts to the car. The discs are vented and slotted along with four pot calipers for superior stopping power assisted by the new brake booster reinstalled last week. Once the discs were in place the steering bar, steering ram, tie rod ends, idler arm etc. fittings were all bolted into place. The tie rods were just finger tight as the geometry has to be completed at some point before the road testing. Due to the full three inch opening of my powder coated headers, there needs to be an extended steering ram spacer fitted. I have covered this on a previous photo set, click here for the quick link or look up Steering Ram in the search. With all the brakes fitted and piped up and the performance springs now in place, the outer shock tower covers could be fitted. This was pretty much the underside of the car completed apart from gearbox, prop and exhaust etc. The engine was attached to the crane and aligned up to the front of the car. John, Yogi, Chris and Me were all there ready and waiting to put the engine in. I was on crane duty listening to the instructions to lower, push forward or back etc. The guys were either side of the engine bay to guide the freshly refurbished engine in place and trying not damage the fresh paint work. 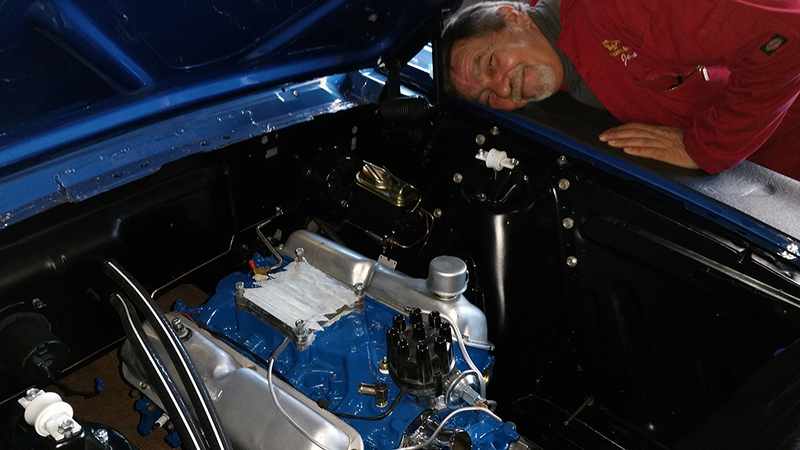 There is a secret to getting the engine in with the hood still fitted and is a closely guarded. Shhh here is some of it! The engine is moved into the engine bay sideways just under the hood, then lowered a little, twist it quarter of a turn so it’s the correct position and lower down again. But I didn’t tell you that! Anyway, as I was on crane duty I still managed to grab a few pics of the process. With the engine almost in place, the long mount bolts were slotted through to take the weight. I have a few pics here of the engine mounts after their refurbishment, not that you will ever see them, but I will know of course. The nuts and bolts were finger tightened on and the crane disconnected from the engine. There she was all sitting pretty and ready to go. 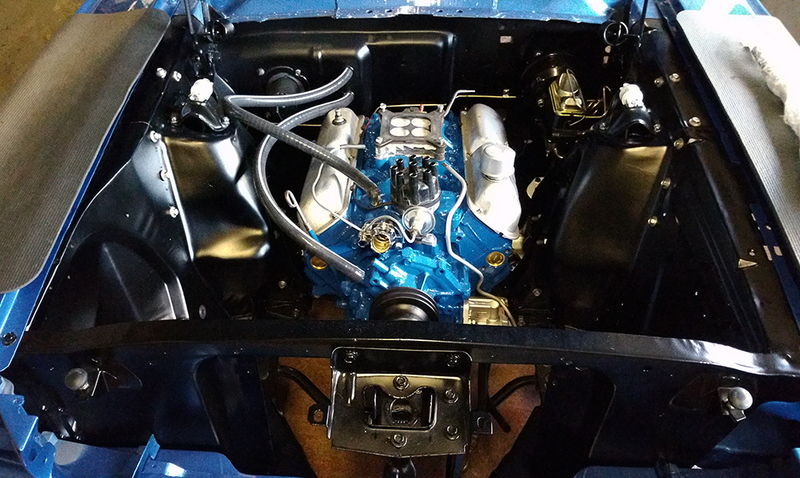 The tape was still in place over the carb inlet and the old rockers cover still there for now. We will test fire the engine and then replace the rockers with the ones I want a little later. The distributor cap is an old one and will be replaced so it’s only there to keep the insides of the distributor clean too. Just to keep the silicon pipe work fresh and the engine clean the Mustang Maniac logo heater pipes were just pushed over the water fittings before the final trim ups as they are much to long at the moment. So there you have it – a major milestone was completed, the engine was in, the heart of the car ready to start beating in the near future. The rear wheels are on the car and the fronts will be on as soon as the steering column gets fitted in place. Then the car will be ready to roll where ever it’s needed to go. 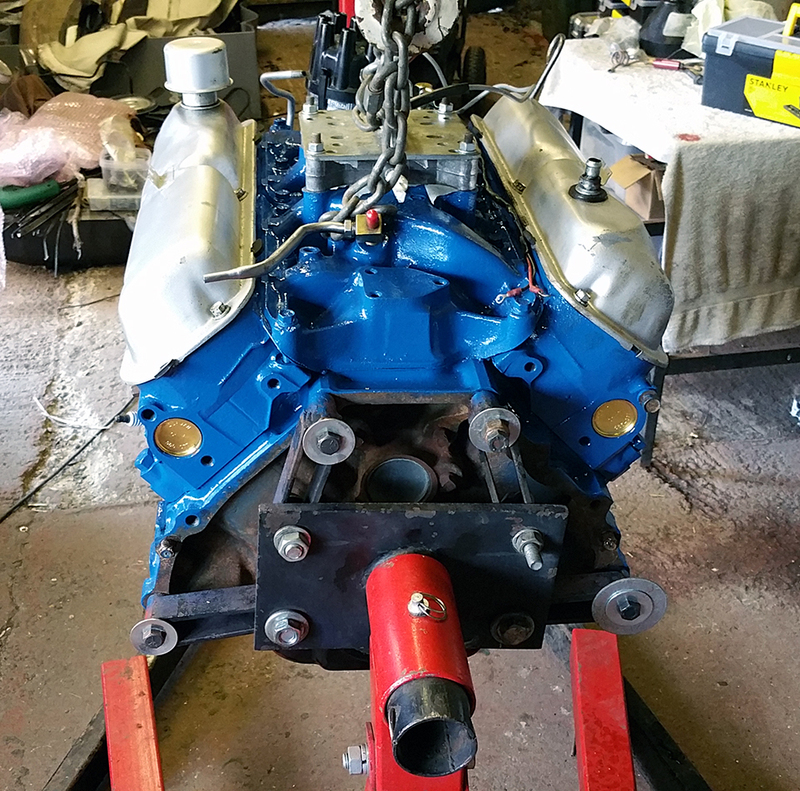 I am so chuffed with the results of seeing the painted engine in the engine bay, the brake pipes, the steering and suspension, I can’t find the right words to express it, and that’s a true first for me! I may be a bit biased here, but I think it looks great even with the old bits still on it. Thanks to the Mustang Maniac guys, yet again. This entry was posted in Car, Photo's and tagged 289cid, Brake pipes, caliper, engine, engine bay, England, front disc brake conversion, headers, heart, heater pipes, hood, Mustang, Mustang Maniac, One man and his Mustang, paintwork, powder coating, steering ram spacer, Yogi. Bookmark the permalink. Thank you, it’s a relief to see some of it come together I must say. There is space at the front of the engine as the fan and rad just about fit in the gap but for now, happy there is a space to work on. We are hoping for the spring time for her to be ready. Warm weather, windows down and a snarling v8 to listen to. That’s my idea of heaven. Thank you, it’s taken its time but we are getting there. This is so exciting. It began with ‘bits and pieces’, and now it is a full blown… ‘get out of my way while i drive my beauty down the street’! Watching these end results is amazing. I hope it won’t be to long. Then it will be arty pictures of the car here there and everywhere. Lol. It all looks the absolute business! I know you’ve thought of it but don’t leave protecting the plated nuts and bolts until you can’t get at them… plating doesn’t last long in our climate. Hi Nigel, yeah I’m with yoU regarding the plating. It should all be protected as it goes on. There will need to be a couple of touch up points, but I was expecting that as you say. It’s very exciting to see it all come together so quickly I must say. Thank you, I must admit it’s pretty darn cool, but I am biased. Lol.